Digestive, aphrodisiac and wholesome for all parts of the body, the Candied Ginger produced by Il Mercante di Spezie is an elixir of wellness. Allow yourself to be enticed by its delicate heat as you savour one of these delicious cubes to freshen up the day with a little spice and energy! Ingredients ginger, sugar, acidity regulator: citric acid, preservative: E220 For more information on product labels, please contact our Customer Service department. The information on the labels of the products may vary for reasons beyond our control, therefore, there may be discrepancies between the information on the site and that on the products delivered. Please always check the information on the product before consumption or use. 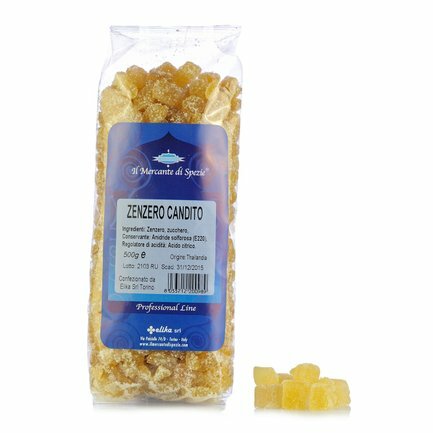 Founded by a group of enthusiasts and professionals in the specialised catering sector, this Piedmontese firm uses the utmost rigour to source spices from all over the world and then combines them to create intriguing and original delicacies: all blends are made by hand and contain no artificial colours or preservatives. 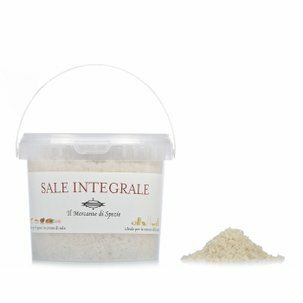 Candied ginger, sweet paprika, Jamaican pepper, Regina cinnamon, Scotch bonnet chili flavoured fleur de sel, Madras curry mix... Use products from Il Mercante di Spezie to transform your regular dishes into delicacies more usually associated with Arabian Nights!